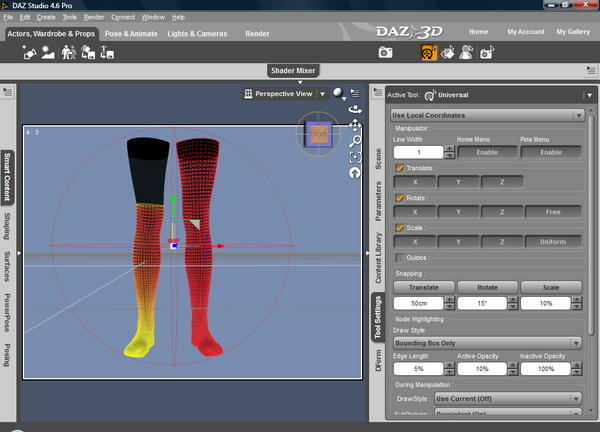 DAZ 3D is pleased to announce the next General Release version of the DAZ Studio Pro - version 4.6.2.120! Yes. We want to provide access to builds that fix issues you may have encountered in the General Release, earlier and more frequently. The 4.6.2.120 version resolves several issues and implements several improvements since the 4.6.1.39 General Release. More detail on specific fixes/changes/improvements can be found in the Change Log, which can be viewed online within the Documentation Center portion of our site. All new downloads of the DAZ Studio 4.6 Pro product (SKU: 13176) will be of this version. 3) Added support for saving/reading favorite properties; favorites are saved in user facing files; scene, subset, character, etc. No, the "Genesis Starter Essentials", "Genesis 2 Starter Essentials" and "Default Lights and Shaders" packages provided with the product have NOT been updated beyond what is currently available. thumbs up - all systems go ! you all did good with fixes . Thanks for getting this one rolled in. Have you tried choosing a new layout and then going back to your custom one (save your custom one first with window > workspace > save layout as if you haven't already)? There's also a script in Library > Scripts > Utilities called Update and Merge Menus. Not sure if this is just for the textual menus, but it's worth a shot. If all else fails, choose a new layout and rebuild your custom one? I tried going to City Limits, which looks fine, and back to my custom layout, which still looks bad. I tried the script to update and merge menus, but that didn't fix it either. I do not want to start over!!!!! We weren't supposed to have to do that anymore. I hope someone can tell me how to fix it. Starting over would be a last resort. I can think of two other options, going into customize and manually deleting all of the extra entries, or edit the dsx for the custom layout file in the appdata. Vaskania, you are brilliant! I did a combination of editing the file you pointed me to and deleting some items in the customizing interface, and I have my workspace back again. THANK YOU!!!!! Edit: Uh Oh! something is still wrong though. 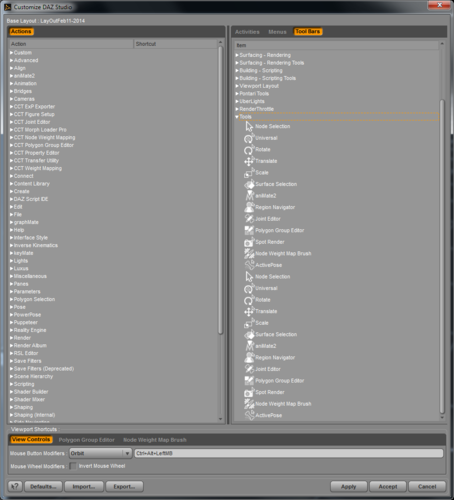 When I close and reopen DAZ Studio or select my custom workspace, I am getting duplication of the tools toolbar again. First I had 2 and now I have 3. I guess I'll have to submit a bug report. I installed it with the .exe file rather than through DIM. It removed the beta version but did not remove the 4.6.1.39 version I had and there is now a /Program Files/DAZ 3D/DAZStudio4 Public Build. 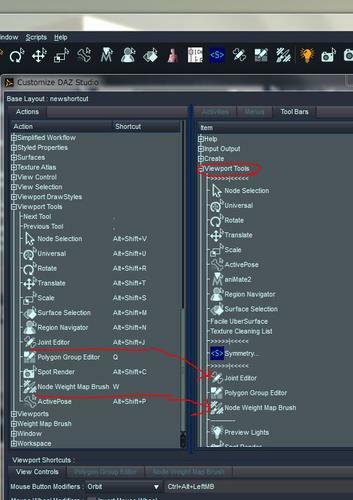 Can I just remove /Program Files/DAZ 3D/DAZStudio4 manually? My tools toolbar keeps duplicating itself as well. Every time I start and stop DS it adds another copy of all the tools to the bar. I've created workspaces with the correct layout but if they include just one copy of the tools when they are re-loaded it will come in with two copies. The beta didn't have this problem. Thank you, I look forward to trying this out over the coming weekend! I wish other DAZ software were updated as regularly as DS. Or at least modernized. 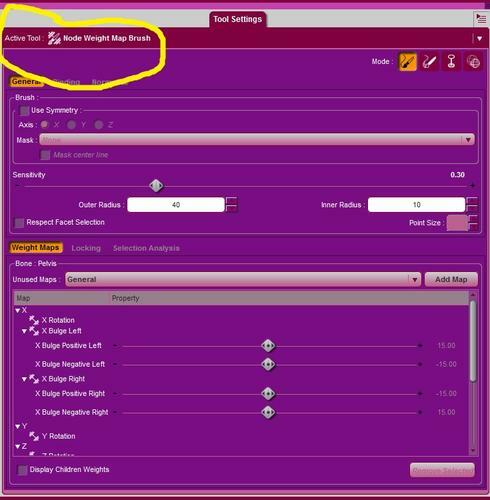 you can find node weight map icon in left side view port tool section of customize window. change right pane( Activities), then view port tools "on"
Toolbars are behaving here, but I'm using my own custom tool bars. It doesn't appear to be all toolbars that are the issue in barbult's screenshot but only the one with the viewport tools - is that the case with anyone else seeing this? What is the toolbar called? Have you added new tools to it? 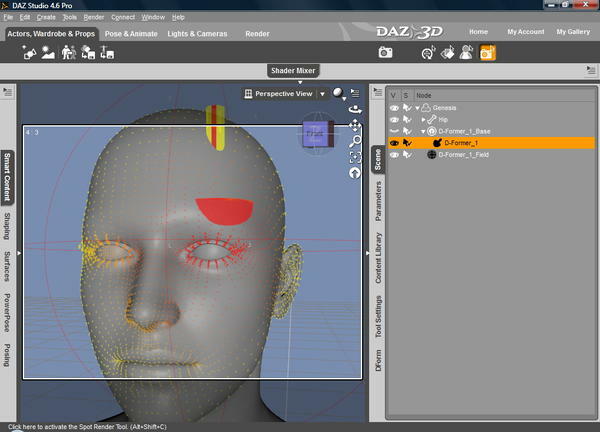 Thank you DAZ for DForm weight map support. Installed 4.6.2.117 and my entire content library dissapeared from Smart Content tab view... all icons are gone and replaced by "!" and when I try to load it says there's no file where it's looking. However the files ARE all there; and are accessable in the (much more tedious to access) Content Library tab. Workflow is seriously impeded... anyone know how I can getf all my content (about 30 gigs) back in Smart Content view? 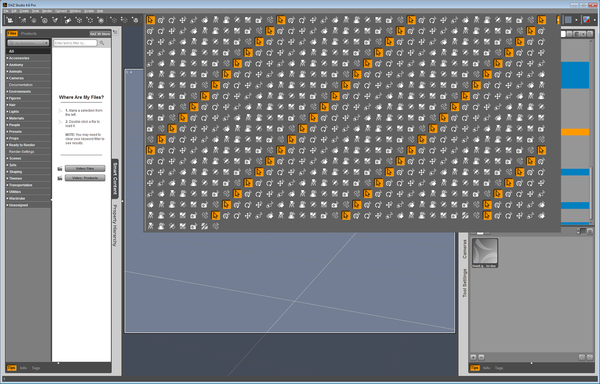 For me it only effects the toolbar named "Tools" It has all the selection tools on it. It just keeps duplicating those tools. Even if I clear it out. The next time I start DS, it readds them all again. 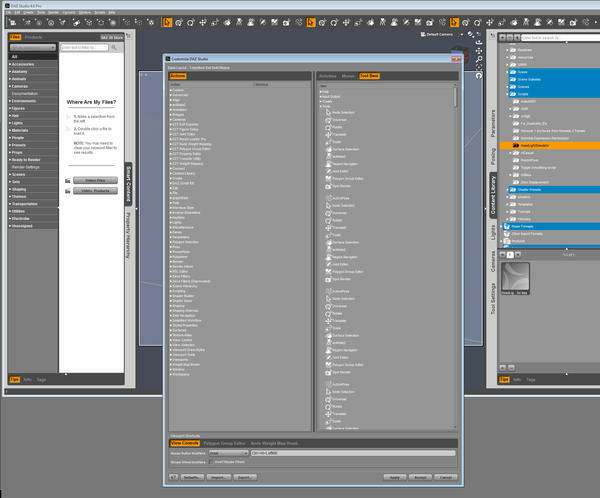 My layout and menus and tools were all highly customized. I'm running on Win7 64 bit. The beta (which has the same workspace customizations didn't have this problem. Thinking it had to have something to do with adding custom commands to the Tools menu, I moved all my additions to their own new private toolbars and deleted the entire Tools toolbar and let DS recreate it. But it still duplicates all the buttons every time I start DS. Yes, I see the issue in the Tools toolbar - as soon as I reenabled it I had the multiple entries. Is there an update on the essential lights bundle and scene builder? I see them listed in product library but DIM does not flag them as updated. For anyone with the toolbar problem try clicking the little arrow at the end of the top of the bar to see if it semi-fixes the problem (the icons may still repeat they just don't overflow into the work space). You can be logged into the forum without being logged in the store account ... it happens. I am actually scared of updating as I am afraid I will loose al my files as per Sederded above there. What's the trick to downloading this? I keep getting asked to register then asked to sign in again, and then bounced to my account overview. Why does it take you to a page to register and when you click you're already a member the page keeps cycling over and over ? Oh and the link to download manually isn't working either . Like Ralph , I wondering what's the trick to download it .